The Mechanical Systems branch provides a full range of mechanical engineering support for aircraft, balloon, suborbital and orbital payloads. 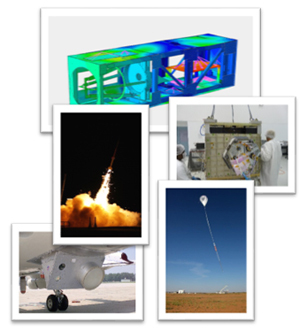 The Mechanical Systems Branch provides mechanical systems mission design and implementation for sub-orbital and special orbital projects and for earth and space science instrument design and development activities at the Wallops Flight Facility. Personnel serve in the Product Design Lead role on key projects and technology development efforts and also provide technical expertise and implementation of integration, testing, and launch operations. The Mechanical Systems Branch provides management and technical oversight of mechanical engineering and technical support tasks under the WFF engineering services contract, and maintains responsibility for the development and management of world-class integration and testing facilities at WFF.